Dua-prayer for sadness and depression: It is not unusual for people to feel sad and even depressed as Allah puts us through many unwanted trials to see whether we are grateful or ungrateful towards Him. Sadness and depression can be eliminated if we focus on Allah and His capability (think of His 99 attributes - Asma ul Husna and dwell on their meaning). In Quran and Hadith, we are often taught about how Allah eliminates sadness and depression if we follow His instructions and guidelines. To gain the maximum benefits from this dua/prayer and end your sadness and depression, you must not only recite it but also understand the meaning. Often times, we recite duas verbally and don't even know what we saying and why we are saying the words. Dwell on the meaning. You can recite this dua after every salah. If you are sad most of the times and go into depression from time to time, it is wise to go see a doctor or even a spiritual healer, but as long as we don't learn to rely on Allah our problem can't disappear. 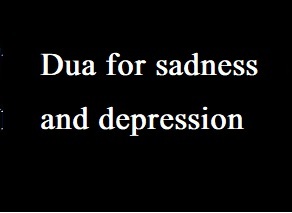 To combat sadness and depression, there are dozens of beautiful duas and prayers at our disposal. Most of the times, sadness and depression are caused by spiritual problems. If there is no obvious reason and you are feeling sad, then you must be aware that your problem has something to do with thinking. Your mind is filled with lots of unnecessary thoughts and as a result you are feeling sad for no reason. Losing control over your thoughts happens when we don't realize that Allah has given us concsious control over our thinking. We are in charge of our thoughts and we have control over what to think and what to not think.